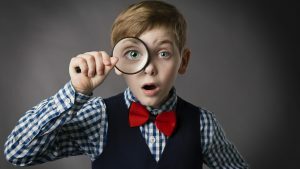 At the recent Code Conference at the Terranea Resort in California, venture capitalist Mary Meeker presented her annual Internet Trends Report. Considered Silicon Valley’s most anticipated slide deck of the year, this perceptive analysis of current trends can be richly informative for entrepreneurs and marketers. 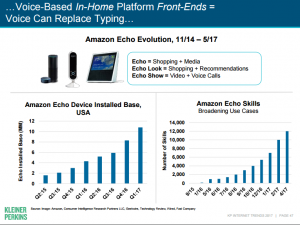 One of the biggest game changers coming down the pipeline in the near future is the rise of voice search. 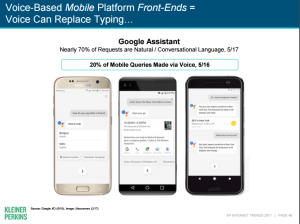 Voice search is poised to overtake textual searches, and not only that, but it involves products like Alexa and Google Home, as well as voice searches via Google on Android devices. This is going to be something that entrepreneurs need to optimize for. Just as traditional SEO has always been a staple of smart online marketing, optimization specifically for voice search is about to become crucial for brands of all kinds. 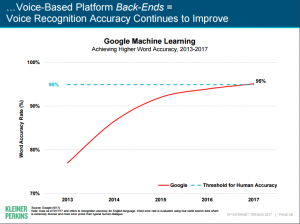 Voice search has become more and more accurate and user-friendly. Today, it’s a preferred means of Googling something for a lot of smartphone users. It’s simple, intuitive, and just as effective as typing in a query. As a result, it’s poised to make waves in the world of search engine marketing. For reference, here are the actual slides from the presentation, which you can check out as a Slideshare presentation via the original Recode.net article. You can check out more key takeaways from the 2017 Kleiner Perkins Internet Trends Report over at Recode.net.